Before the Voyager probes visited Jupiter, if you had described Io to a literary critic it would have been declared overwrought science fiction. Jupiter's strange moon is literally bursting with volcanoes. Dozens of active vents pepper the landscape with volcanic rings the size of California. The volcanoes themselves are the hottest spots in the solar system with temperatures exceeding 1800 K (1527 C) about 1/3 the temperature of the surface of the Sun. The plumes which rise as much as 500 kilometers into space are so large they can be seen from Earth by the Hubble Space Telescope. Confounding common sense, these high-rising ejecta seem to be made up of, not blisteringly hot lava, but frozen sulfur dioxide. For a world dominated by fiery volcanoes, it's curious that Io is also very, very cold. The ground just around the volcanic vents is literally sizzling, but most of Io's surface is 150 degrees or more below 0 C.
What powers the tremendous volcanic activity? Tides! But the tides on Io are not like ocean tides we're familiar with on Earth. The gravitational fields of Jupiter and its large moons Europa and Ganymede cause tidal bulges in the solid crust of Io that are as high as 100 meters (330 feet). As Io orbits the giant planet, the bulge moves, flexes the crust, and heats Io's interior like a paper clip bent rapidly back and forth. Infrared observations have shown that the thermal energy released by Io's hot spots is on the order of 125 trillion watts which is about 2.5 W/m2. By contrast the moon's outward heat flow is 0.02 W/m2 and the Earth's average heat flow is 0.06 W/m2. One week prior to Voyager 1's encounter with Jupiter, Stanton Peale published a paper suggesting that tidal heating might produce volcanism on Io. His prediction was spectacularly confirmed on March 8, 1979 when Voyager 1 captured geyser like eruptions spewing material hundreds of kilometers above Io's surface. Yet mysteries still remain. Why is the lava on Io so hot? Billions of years ago basaltic lava on Earth was about that hot, but now -- thanks to mixing in subduction zones -- terrestrial basalts have a lower melting point. Lavas we see now on Earth are about 300 K cooler than they used to be. It's very surprising to see lava flows on Io as hot as these ancient flows on Earth. Why? Simply because Io's soil has been reworked many, many times, so the melting temperature should be lower for the same reason that Earth's basalts melt at a lower temperature. Originally scientists thought the lava flows were sulfurous, but sulfur vaporizes at ~700 K. The 1800 K regions have to be basaltic. Now the question is, "Are any of the lava flows sulfurous?" The Galileo spacecraft has detected areas on Io with temperatures between 300 and 600 K, which is about right for molten sulfur. 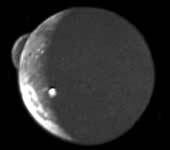 In addition, the yellow-brown colors on Io are suggestive of Sulfur compounds. When Voyager spotted the volcanic plumes on Io, planetary geologists thought they were produced by explosive volcanic eruptions; however, it soon became apparent that this idea was flawed. On Earth explosive eruptions are violent and short-lived, but on Io six of the eight plumes seen by Voyager 1 were still erupting when Voyager 2 flew past four months later. It was also calculated that explosive eruptions could not throw volcanic material that high. So what produces these gigantic plumes? The answer is a phenomenon similar to geysers on Earth. Although geysers are relative small on Earth, the low gravity on Io (about 1/6th that of Earth) and the lack of atmospheric pressure produces the spectacular results observed by the spacecraft explorers. Indeed, if Yellowstone's Old Faithful were placed on Io, its plume would reach heights of 37 kilometers. Yet Io is exceeding dry with little water. So what powers these plumes. Scientists believe that sulfur and sulfur dioxide, which are so abundant on Io, provide the means. When liquid sulfur dioxide comes into contact with hot material below the surface, the superheated, boiling liquid rises quickly through fractures in the surface and produces a high-velocity column of gas. Because of the extremely cold conditions, the gas immediately starts condensing into sulfurous snowflakes. The Galileo spacecraft was fortuitous to fly though the plume of a previously unknown volcano. Its onboard plasma science instrument detected sulfur dioxide snowflakes made of particles that had rushed out of a vent on the ground no more than a few minutes earlier.